Are you a non-technical co-founder looking for a technical co-founder? The trouble with your situation is depicted simply in the popular business fable of the chicken and the pig. To summarise, the chicken is trying to coyly persuade the pig to open a ham and eggs shop to which the pig replies “no thanks, I’d be committed, but you’d only be involved”. Translation: The pig would be butchered and fried on a pan while the chicken sits pretty on a nest laying eggs. Why is this relevant you may ask? The same predicament greets tech and non-tech co-founders who are interested in forming a start-up; in that the technical resource will more than likely need to spend more time working and building a product or service then the non-technical resource, thus making it seemingly a one-sided dysfunctional relationship at first glance, which is exactly what you want to avoid as a non-tech co-founder. We all know that being an ideas man or woman is easy; you can flip and flop as much as a bobble-head, and not commit your time and effort to building anything. So you probably should spend some time and actually do some work beforehand to show you’re more than a bobble-head. Develop a product or service concept to the point where you’ve performed enough due diligence to put a micro business plan into action. You can learn about and perform useful concept validation activities such as completing a lean canvas diagram, creating a list of functional requirements, hand-drawing or using software to make prototypes, devising use cases, designing the branding, establishing supplier contacts, or performing any other necessary activities to highlight the business opportunity. You’ll often find that proving your value before asking someone else to prove theirs yields favourable results in business. Developing your concept will give you and any potential co-founder more assurance that the venture you’re both about to embark upon is worthwhile. It also shows that you’re capable of producing output (hopefully to a good standard). Would it be hard for you to learn about the skills that you need in a tech co-founder? Your knowledge of the underlying technology needed for your concept will most likely make the working relationship between you and your co-founder more efficient, as you’ll have a better appreciation of the product/service build considerations and possibilities. What do you contribute to your start-up? Skills, experience, stellar contact list, money? A famous quote from the bible states “it is more blessed to give than to receive” and this is highly relevant to an early stage start-up. If you’re looking for a laboring tech co-founder, you could improve your prospects by honing a particular skill, expertise, personal network, or anything else that can add tangible value. For example, if you’re a bricklayer, and you don’t mind launching a start-up in the industry but want to create your own online business in the trade then your experience, skills or contacts could be of value to a start-up serving customers in the bricklaying market. Try to pursue concepts where you have significant value to add as this will make it easier to not only find a tech co-founder but will also reduce your chances of start-up failure. LinkedIn is a great tool for recruitment and is equally useful when hunting for technical co-founder talent. There are a number of search criteria you can use to target individuals who have the experience or skill that fits the bill. There are also a number of other websites where you can pitch your concepts to pools of possible tech co-founders, which can be fun and a little intimidating for some. If you’re more of a social type then hackathons and tech meetups or conferences are good options as they pull in large numbers of individuals who are tech co-founder types. During such events, you’ll get plenty of chances to mingle and talk to people about their skills and background to determine suitability. Keep in mind that techies are no different to the hot bombshell from your senior school or university in that they have a sixth sense for spotting desperation. Just remember no one wants to be courted by someone who appears desperate as it just makes any situation awkward and uncomfortable for the parties involved. To candidates that you’re reaching out to via LinkedIn or email ensure you draft a short email explaining the purpose of your contact, why you chose the candidate and why he/ she should consider the opportunity. Here’s an example – “Hi [insert their name], my name is [insert your name]. I’m a [insert your expertise or role]. I see you’ve got experience in [insert their skill or expertise]. I am looking at opportunities in the [insert industry]. I’ve got an opportunity I would like to discuss with you that could be of interest. Can we perhaps connect or swap emails or meet to discuss further? Thanks”. To people you’re first meeting face to face, try a natural conversational and free-flowing elevator pitch rather than a one-sided podium style pitch. If the individual is considering joining, he/she should naturally ask questions but try to make a conscious effort to not get defensive nor offended in your responses. Reiterate the facts supporting the concept, the value of your contributions and the soundness of your plan to assure the candidate that the opportunity, and you, are a legit package. Over the ensuing days, weeks and/or months, you should have arranged follow-up meetups and informal ‘homework’ tasks for both of you before formally making an offer and agreeing on terms with your new tech co-founder. 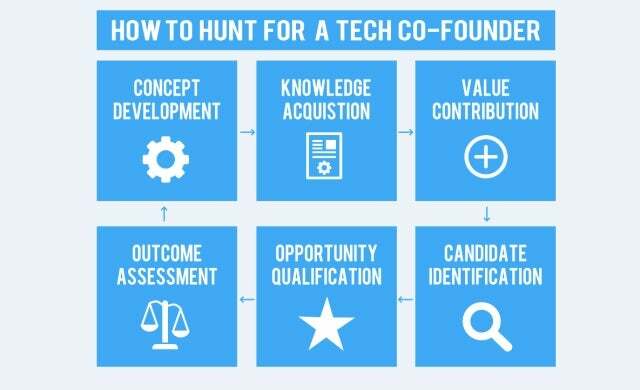 Once you’ve gone through the steps above, you should hopefully have yourself a shiny new technical co-founder! If not, no worries it means you’ve probably got some more work to do. Usually the questions people ask of you and the concerns they voice will give you an indication of the areas you need to address and improve upon in steps 1 to 5. You’ll find the first few potential technical co-founders who turn you down will provide useful feedback which will allow you to make incremental improvements on your approach.